This week’s set of exquisite fossils is presented in honor of Andrew Retzler (’11) who has just had his Senior Independent Study thesis at Wooster published in the journal Cretaceous Research: “Chondrichthyans from the Menuha Formation (Late Cretaceous: Santonian–Early Campanian) of the Makhtesh Ramon region, southern Israel“. 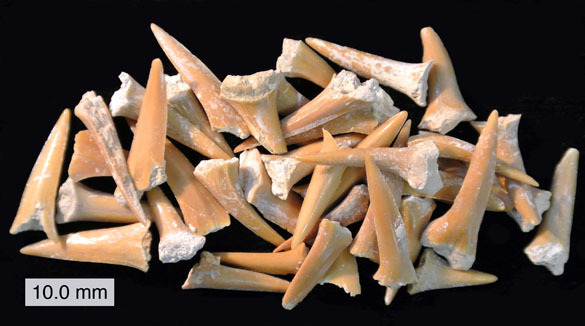 The above beauties are a mix of Scapanorhynchus teeth found in the southwestern portion of Makhtesh Ramon during Andrew’s study in the summer of 2010. We were ably assisted by Micah Risacher and Yoav Avni with these collections. Andrew identified at least eight shark species and two other fish species in the Menuha Formation around Makhtesh Ramon. Most of the teeth are from a soft yellowish chalk with relatively few other fossils (mostly oysters, echinoids, foraminiferans and traces). They show that the Menuha was deposited in a shallow, open-shelf environment on the flanks of the developing Ramon anticline. 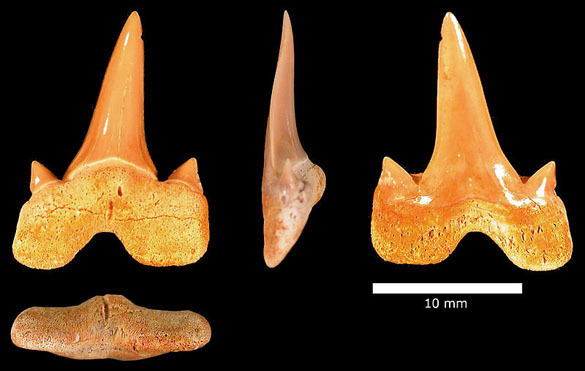 So, they not only provide new information about Cretaceous sharks in the Middle East, they help sort out a complex stratigraphic-structural problem. 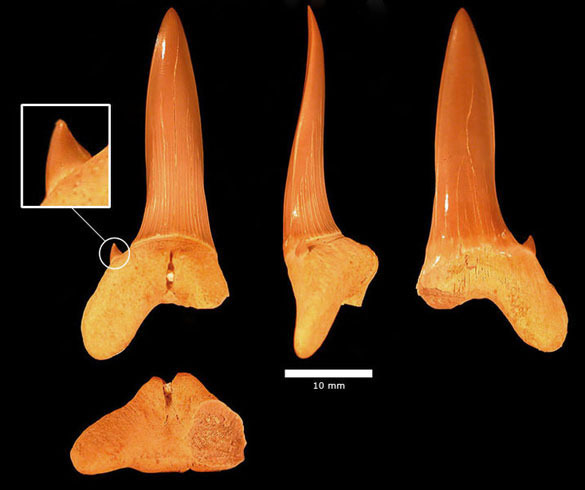 Tooth of the shark Cretalamna appendiculata. Composite photo by Andrew Retzler. Scapanorhynchus rapax, another shark species. Composite photo by Andrew Retzler. An elegant Scapanorhynchus texana tooth. 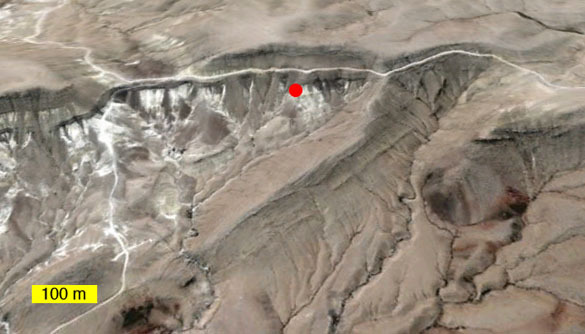 Looking south at one of the productive exposures of the Menuha Formation (shown as the red dot) at Makhtesh Ramon. This is one of those amazing Google Earth images.